This says it all for me today. I prayed for peace today for a client of mine. Jesus says he gives us peace but not the kind of peace that the world can give. And I am not really sure what that means because I don't see that the world really has any kind of peace to offer me. Certainly not the peace that assures us that everything will turn out fine. And I don't think that is what Jesus is offering us either. When he says, "do not be afraid" I don't believe he is saying, trust in me and you will never encounter circumstances that will make you fearful. Because I know we do. We live here and this world is filled with things that cause fear. Like cancer. When you work with a client like I often do ... for weeks and months ... you not only become part of their home, you become a part of their lives. And today, one of those clients of mine had to undergo surgery for cancer. And that is not peaceful in the way of this world. Because in this world there are so many things that can go wrong. We can put our hope in doctors and in medicine and in technology. But they can fail us. And even with everything going right, things can still go wrong. So what is this peace that Jesus is talking about. 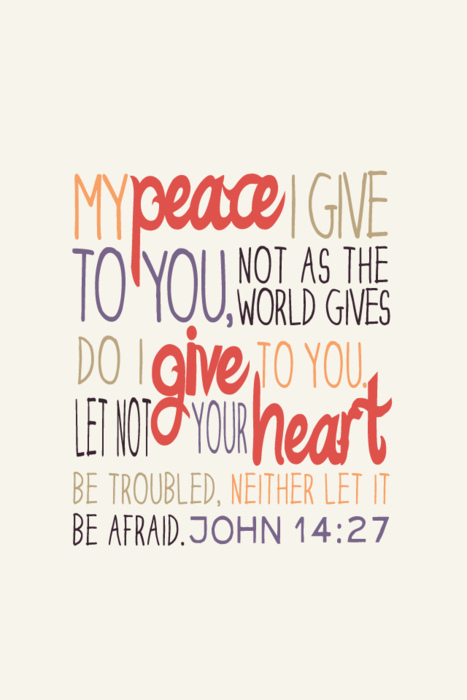 "Do not be troubled, do not be afraid"? Because that is really hard to do when we are facing death, or pain, or uncertainty. What I believe he is saying is that you will face things here on this earth that are hard. Very hard. But through it all He will be with us. And that in the end (not this end, the the end) everything will be okay because He loves us and we can count on that. And that is what I prayed for this client of mine. That through this circumstance that is not easy, that they would feel God's peace. His presence. His power and strength. And his love. I pray that we can all experience that kind of peace. The kind of peace that says there is someone bigger than us that is in control who really cares about us and even though things don't always look right or seem right, in the end they are. It is like that big tapestry of our lives that He is weaving. And all we see are the messy strings hanging down ... tangled and chaotic. But He sees what we cannot; the beautiful artwork that it will be. Someday.